January is the perfect time to wipe the slate clean and continue to better yourself! As 2016 was coming to an end there was a constant buzz around what types of New Year resolutions to make. 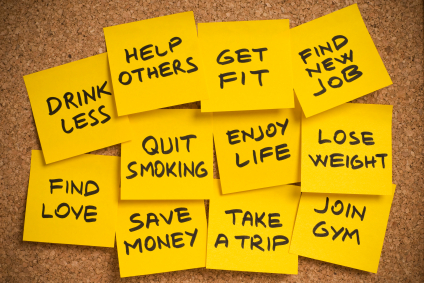 At Joe’s, we want to help you achieve your resolutions! But, what were some of this year’s most popular resolutions? • Get Healthy: Try to get active for at least 2 hours a day! • Get Organized: No more hoarding! Go through your stuff and clear out all of the unnecessary things you’ve been keeping (you know you don’t need that cable bill from 2015 anymore!). • Live Life to the Fullest: Get that bucket list and finally start crossing stuff off the list! • Attain Financial Freedom: For many of us, this means improving our credit score and maybe saving a little more money this year. It is always great to wake up in the morning with a new aspiration and drive for the day but we have to make sure this isn’t just a temporary thing. “[Research shows] that only about 8 percent of people actually achieve their New Year’s goals,” said Dr. John Agwunobi chief health and nutrition officer for Herbalife. Whether you decide to start each morning in the gym, save that $100 a week, or maybe finally make a financial decision to purchase a new home or vehicle, it’s important to keep the long term benefit in mind so that you achieve the goals you’ve set for yourself. Joe’s Auto Sales wants to be there for you every step of the way keeping you on the right track. Let us be the place you start to fix or build your credit. We work with all credit situations, and budgets of every size, and work hard to ensure that “everyone rides at Joe’s”. So not only will you get to ride off in that vehicle that you’ve been wanting to upgrade to, but you get to better yourself and use us as stepping stone to a brighter future. WISHING YOU A HEALTHY, PROSPEROUS, HAPPY NEW YEAR! What's the best place to watch the Super Bowl in Indianapolis? This entry was posted on Monday, January 16th, 2017 at 5:28 pm	and is filed under Just for Fun. You can follow any responses to this entry through the RSS 2.0 feed. You can skip to the end and leave a response. Pinging is currently not allowed.